Just in time for Easter -- Carrot Cake with Cream Cheese Frosting! 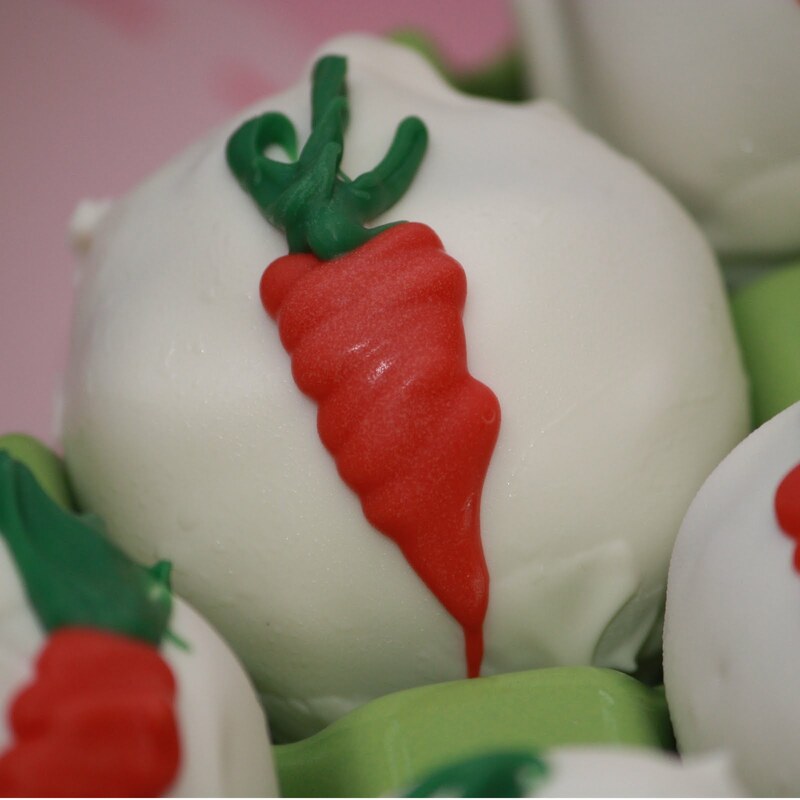 Cake Balls make the perfect party favors!! 6 layer cake, alternating chocolate and vanilla layers with 3 different types of chocolate filling...dark chocolate, semi-sweet chocolate & milk chocolate. All frosting is French Buttercream...total of 4 lbs butter, 24 egg yolks and 4 cups of sugar. What's not good about that?!?! Made these for gifts for two of Jack's special girls. Hi Friends! Had a fun Spring Break but unfortunately have lost my Iphone. if you need to place an order. Made these chocolate cake balls for sweet friend's birthday. Put candles in them so each person can make a wish for the birthday girl. Happy Birthday Friend!!! Whipping Cream Cake mixed with chopped up Oreos and Buttercream frosting then dipped in white chocolate and topped off with more chopped oreos. Are they good? What do you think? Almond Amaretto Cake mixed with Amaretto Buttercream...one word...YUM! These Pistachio Cake Balls are so beautiful (and yummy, too!) with a pale green center. They are a must have for your St. Patrick's Day event! Perfect for a shower or ladies luncheon!! Super Cute and Super Yummy!!! All the boys in my house LOVED these!!! They can be dipped in any color white chocolate to match any party! Aren't these gorgeous? And they taste SOOO GOOOOD!!! I made a coconut cake with dark rum and Malibu. Then mixed in a fresh pineapple cream cheese frosting. These were dipped in the white chocolate coating. YUM!! I think these are my favorites so far. After making most of the balls, I added a little Kahlua into the rest of the mixture. (When we were "pre-parents" we used to win trips with work and go on all kinds of fun vacations. One of the trips took us to Lake Las Vegas where the bar tender introduced us to a Kahlua Colada. Its basically pina colada with some Kahlua. So good and sooo fattening!!!) These really were delicious, too! These are for the serious chocolaholic!! Seriously! Thought sweet husband was going to propose all over again after he tried one of these!